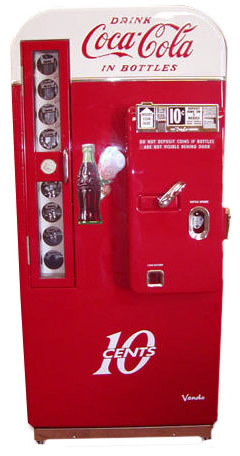 The Vendo 81 Soda Machine Is One Of The Most Sought After Of The Antique 1950’s Coke Machines. Vendo Retro Vintage Soda Machine comes in three different models, the Vendo 81 A, Vendo 81 B, and Vendo 81 D. These models offer all the bells and whistles that our customers want! The “A” model was done in all red and has a green medallion on the bottle door. The Vendo 81 B looks much like the A but the logo has been moved over and a two-tone paint job has been added. For the Vendo 81 D, the embossed area was enlarged and moved over just a bit more than the B. The Vendo 81 D also has a larger door then the other two machines with a different coin mech.